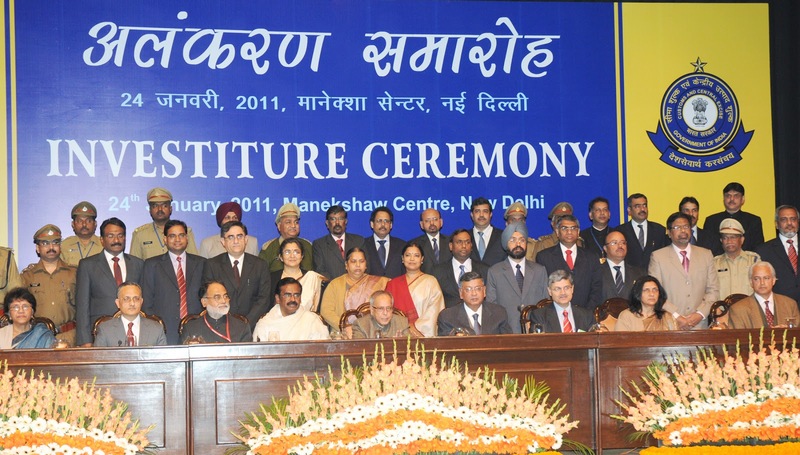 ON THE eve of the Republic Day, Union finance minister Pranab Mukherjee presented the Presidential Awards to the officers of the Customs and Central Excise and Directorate of Enforcement for exceptionally meritorious service. Whereas Satish Hari Kulkarni, Inspector, Customs Commissionerate of Pune won the award for exceptionally meritorious service rendered at the risk of life, New Delhi-based Additional Director General Debi Prasad Dash and Commissioner (Central Excise), Central Board of Excise and Customs Ajay Jain won awards for specially distinguished record of service. 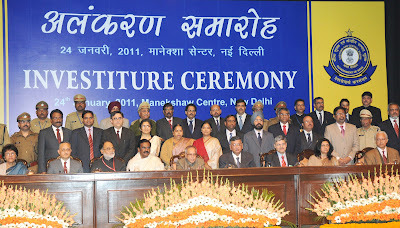 The other officers who also won Presidential award of appreciation certificate include Navneet Goel, Director (Drawback), CBEC, MK Singh, First Secretary (Trade), High Commission of India, London, Subhagata Kumar, Additional Director, Directorate General of Systems and Data Management, New Delhi, Sunil Tated, Additional Director, Directorate of Revenue Intelligence, Suresh Kumar, Additional Commissioner, Customs Air Cargo Complex, Bangaluru, Manish Kumar Sinha, Additional Commissioner, Central Excise Commissionerate, Pune-III, SD Chand, Deputy Director, Directorate General of Valuation, Mumbai, R Ravikumar, Deputy Director, Directorate General of Central Excise Intelligence, Chennai, SM Mani, Assistant Director, Directorate of Enforcement, Zonal office, Chennai, Dharmvir Singh, Officer on Special Duty, TRU, CBEC, New Delhi, G Gururaghavendran, Superintendent, Directorate General of Systems and Data Management, Chennai, VS Syed Mohammed, Senior Intelligence Officer, Directorate of Revenue Intelligence, Regional Unit, Cochin, Jayaraj PG Nair, Senior Intelligence Officer, Directorate of Revenue Intelligence, Zonal Unit, Mumbai, Surinder Singh Dangi, Senior Intelligence Officer, Directorate of Revenue Intelligence, Zonal Unit, Ahmedabad, I Ramalingeswara Rao, Superintendent, Central Excise Commissionerate, Vishakhapatnam-II, Prabir Kumar Bhadra, Senior Intelligence Officer, Directorate of Revenue Intelligence, Sub-Regional Unit, Berhampore, KC Meena, Senior Intelligence Officer, Directorate General of Central Excise Intelligence, Regional Unit, Jaipur, Manish Immanuel, Senior Intelligence Officer, Directorate General of Central Excise Intelligence, Regional Unit, Ludhiana, Bijender Singh Yadav, Superintendent, Central Excise Commissionerate, Delhi-III to name a few. Members of IAS Officers Wives Association, or IASOWA gathered in New Delhi’s Chanakyapuri on Saturday to celebrate the annual winter carnival with much extravaganza of fun and frolic. According to reports, thousands of people thronged the venue that saw setting up of 70 stalls. The sunny morning made everyone spirited. Significantly, it raised funds for Prerna School meant for children of daily wage earners and Thyagraj Stitching and Computer Training Centre for the needy, both of which are being run by IASOWA.